How hard is it to get into TED? Even at a cost of $7,500, the Technology, Entertainment, Design idea-fest, which begins Tuesday in Long Beach, Calif., is always oversubscribed. Organizers carefully vet applications to choose the 1,350 who get in. Kate Brodock applied to TED conferences for eight years straight before being accepted in 2010 to TEDWomen, one of the occasional thematic offshoots of the main TED gathering. Brodock, who is chief marketing officer for the nonprofit Girls In Tech and social-media director at Syracuse University, says she didn’t pick her pursuits to get into TED, but recognizes that her profile has become closer to that of the typical attendee. “If I am doing the types of things that these really inspiring speakers are up on stage talking about, then I’m on the right track,” she says. The application has six, short college-essay-style questions: How would a friend describe your accomplishments? What are you passionate about? Share a story from your life that shows what makes you tick. Applicants are also asked to provide websites that will help conference organizers get a better sense of who they are, such as their blogs, academic research, or company websites. Who you know counts too. TED requests at least two references, and asks if those vouching for applicants have attended the conference in the past. 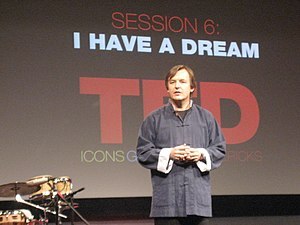 While it notes that “it isn’t necessary that they have,” Brodock says that a referral from a TED attendee, speaker, or high-profile name “significantly helps your cause.” Above all, she says, “you can’t fake it on a TED application.” Organizers look for people who are leaders in their fields and will sniff out padded, pandering resumes. via How to Get into TED? It’s Like Applying to College—Again and Again – Businessweek.